Photograph collection of webmaster. 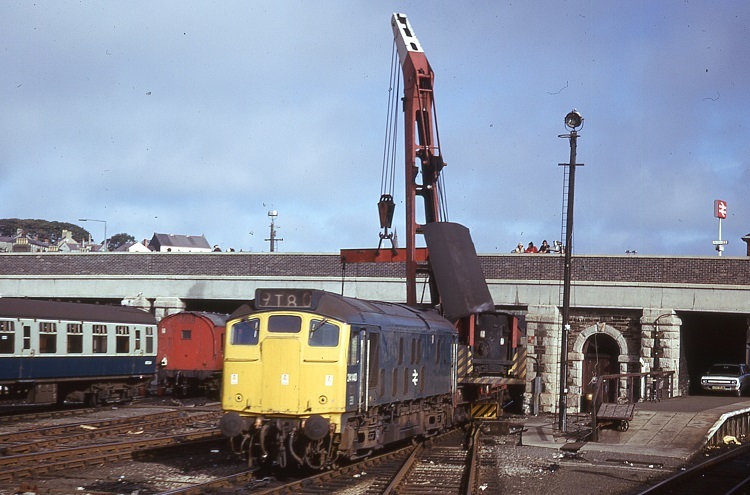 Its August 24th 1974 and 24140 is in attendance with a breakdown crane at Holyhead station to assist in the rerailing of some coaches. The fifteen year three month career of D5140/24140 was spent allocated only to London Midland Region depots. 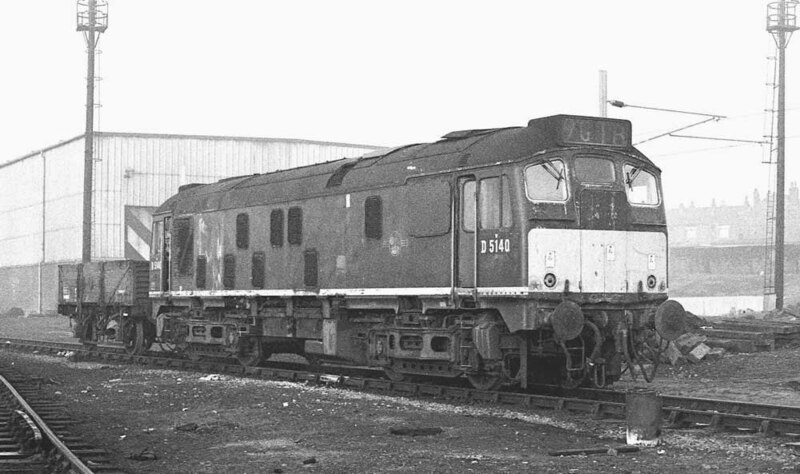 After withdrawal 24140 was stored at Crewe from January 1976 until May 11th 1976 when it was forwarded to Swindon Works and broken up by the third week of September 1976. Movement: 24046 (? ), 24140/144/146 Crewe – Swindon May 11th 1976. Noted Derby Works February & April 1961. Noted Derby Works January 1973. The large allocation of Type 2s handling the passenger services out of Euston were frequently idle over the weekends. They were often utilised on excursions, typical of this was the visit of D5140/D5146 from Northampton to Margate on June 16th. Early December also saw the majority of the steam workings cease on the Shrewsbury - Aberystwyth line with the exception of the up & down Cambrian Coast Expresses, handled usually by Class 5s 75012/29/60. Effective December 5th Chester & Crewe depots became home to a number Class 24s, recently reallocated to Stoke Division (D05), whilst Holyhead depot closed to steam. The Class 24s took over all freight workings along the North Wales coast. Likewise the passenger workings fell into the hands of reallocated EE Type 4s, at a stroke steam became a rarity along the North Wales coast. As the New Year began Shrewsbury diagrammed Class 24s to handle the Cambrian freight workings, on January 2nd 1967 D5073 handled the 04.20 to Aberystwyth, D5140 the 05.00 to Machynlleth and D5144 the 07.25 to Newtown. Condition September: green livery with small yellow warning panels, curved upper corners, bottom of warning panel partially covers the frame level stripe, shortened fuel & water tanks, blanking plate fitted, hand/footholds still present, straight sided sandboxes, three-rung bogie mounted footsteps, some valencing missing, exhaust above engine room. Photograph courtesy Tom Sutch. Not sure of the date on this one but it is probably about 1970 judging by the condition of the locomotive. The paintwork looks like its little changed since it was outshopped from new apart from the yellow warning panel. It looks like D5140 won't be leaving Springs Branch immediately, it has no fuel tank. On June 11th 24140 was noted at Stoke-on-Trent headed for Cockshute with the returning Cheadle trip. On June 22nd Rhyl was graced with 24032 & 24140 on a special from Tamworth. Condition June 1975: blue/yellow livery, gangway doors in place, shortened fuel & water tanks, blanking plates fitted, hand/footholds sheeted over, straight sided sandboxes, three-rung bogie mounted footsteps.